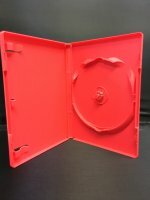 High quality DVD style case suitable for Video, Games, & Music. Made in the USA 100% Polypropelene virgin material . Sturdy hub lock to keep disc in place when shipping.